DEVELOPING NOW: ] GUNSHOTS RING OUT ON A SCHOOL CAMPUS ONCE AGAIN. EXACTLY A WEEK AFTER THE school shooting in SANTA FE, texas---a middle schooler in indiana came to school with a gun. A TEACHER STEPPED IN TO STOP HIM. ] ROB STAFFORD IS IN OUR NEWSROOM WITH DETAILS. ROB? A male student opened fire in a classroom at a middle school in Noblesville, Indiana, injuring a teacher and fellow student before being taken into custody, authorities said. 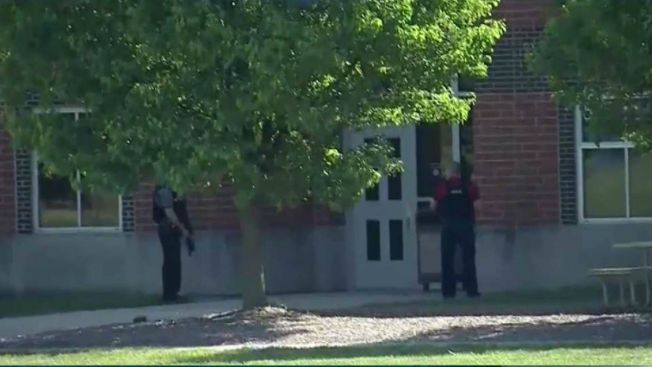 Authorities responded to Noblesville West Middle School shortly after 9 a.m. for reports of an "active shooter" at the suburban school roughly 20 miles north of Indianapolis. The injured teacher, identified as Jason Seaman, and the student, Ella Whistler, were taken to local hospitals with gunshot wounds, officials said at a news conference Friday. Whistler's family said in a statement she was in critical but stable condidition and was doing well. "We will spend the next days and weeks processing what happened and why," the Whistler family statement said. Authorities say a suspect is in custody after a shooting at an Indiana middle school. According to seventh-grader Ethan Stonebraker, the injured teacher had tackled the student firing shots inside the classroom. Stonebraker said the class had been taking a test when the student walked in and started firing. The teacher "immediately ran at him, swatted a gun out of his hand and tackled him to the ground." "If it weren't for him, more of us would have been injured for sure," Stonebraker said. Authorities confirmed the shooter, who has not been identified, left class and returned armed with two handguns. The suspected male student was detained at the scene and was not injured in the shooting, according to police. A motive was not immediately known, and it was not clear where the guns came from. Stonebraker also said he knew the suspected gunman, whom he described as "a nice kid most of the times" and said he often joked with the classmates. Officials noted that a threat was later made at nearby Noblesville High School, roughly four miles from the middle school in the same district and the location where students were being taken to be picked up by their parents. Multiple law enforcement agencies responded to the high school and were sweeping the area, officials said, adding that police had not received any information other than the communicated threat. "I just want to get my arms around my boy," she said. "I got a 'Mom, I'm scared' text message and other than that, it was 'come get me at the high school,'" Higgins said. Another mother was so shaken up that she had to be driven to the school. Jennifer Morris appeared slightly dazed as she arrived at the high school gymnasium to pick up her 14-year-old son Noah. She said she was at work Friday morning when her son sent a text message about the shooting, stunning her with the message, "I'm OK, please come get me." Indiana Gov. Eric Holcomb issued a statement following the shooting saying he and leaders of the legislature were monitoring the situation as they traveled back from a trip to Europe. "Karen and I are praying for the victims of the terrible shooting in Indiana," Vice President Mike Pence, the state's previous governor, tweeted Friday morning. "To everyone in the Noblesville community – you are on our hearts and in our prayers. Thanks for the swift response by Hoosier law enforcement and first responders." Friday's shooting came one week after a police said a student opened fire at a high school in Santa Fe, Texas, killing 10 people and wounding 13 more.